David Godfrey, who died on June 21 of pancreatic cancer, was the owner of Godfrey-Brownell Vineyards, the eighth Cowichan Valley winery when it opened in 2000. The winery capped a life filled with an astonishing number of careers and achievements. He is almost certainly the only winery owner in British Columbia to have won a Governor General’s Literary Award. David was born in Winnipeg in 1938 and grew up in Ontario, where his parents moved when he was 7. The upbringing engendered a lifelong appreciation of Zinfandel, a popular variety for home winemakers. “I guess I was always interested in wine from my Cooksville days,” David told me. His education included a degree from the University of Toronto and graduate degrees from Iowa State and Stanford Universities. That led to a career as a university teacher. That interest in music re-emerged at the winery, which regularly hosted concerts by a wide range of musicians. During the late 1960s, he became a powerful figure in Canadian publishing. The Quill & Quire obituary says: “‘In the decade after 1967, Dave Godfrey was a powerhouse in Canadian writing and publishing,’ says Dennis Lee, who in 1967 co-founded House of Anansi Press with Godfrey. At the time, Anansi, which was instrumental in publishing early work by Michael Ondaatje, Margaret Atwood, Graeme Gibson, and Matt Cohen, was located in the basement of Godfrey’s rented house on Spadina Avenue in Toronto. Two years after launching Anansi, Godfrey joined Roy MacSkimming and James Bacque in beginning New Press. ‘Both presses were passionately nationalistic in mission,’ says MacSkimming, ‘with Anansi focused more on literary publishing, New Press more on political and social issues.’ Along with his wife, Ellen, Godfrey started Press Porcépic in 1973.” This was an outlet for experimental writing. He moved to Victoria in 1978, becoming chair of creative writing at the university. At the same time a new interest in technology led him to help write several books on the subject. Ultimately, he and Ellen launched one of the earliest internet service providers in Canada. Throughout that career, he never lost his urge to farm. His grandparents had lost a farm in Saskatchewan during the Depression, leading to a family determination to acquire farmland again. He actually tried to buy land in Saskatchewan but was thwarted because he was not a resident of the province. Finally, he was able to combine a passion to farm with a passion for wine. “I did my graduate work in the States, partly in Iowa and partly in California. I used to make wine with Raymond Carver in Iowa, the famous writer. He was a student there too. I always made wine. So about the early ‘90s we started looking for a farm.” Ultimately, he bought a farm in 1998 south of Duncan and planted grapes for the winery named Godfrey-Brownell. The public sometimes took the winery’s doubled-barrelled name as a partnership. Sadly, the founding partner is now also silent. Burrowing Owl Estate Winery recently trumpeted the significant awards it brought home from several international wine competitions this spring. Other British Columbia wineries do the same. These are mostly the larger producers who can afford the hefty entry fees. It is a valid test of how BC wines stack up. It no longer is a surprise that the wines hold their own. The surprise is that some of the same wineries have stopped competing in the Lieutenant Governor’s Awards of Excellence in BC Wine, even though there is no entry fee. Granted, this is not as widely recognized as, say, the Decanter World Wine Awards. But I will bet that the consumers who actually buy most BC wines are better acquainted with the LG Awards than with Decanter. To put international competitions in perspective, Syrah du Monde charges 180 Euros per entry and asks for six bottles of wine. The winery can provide tasting notes at an additional 55 Euros an entry. 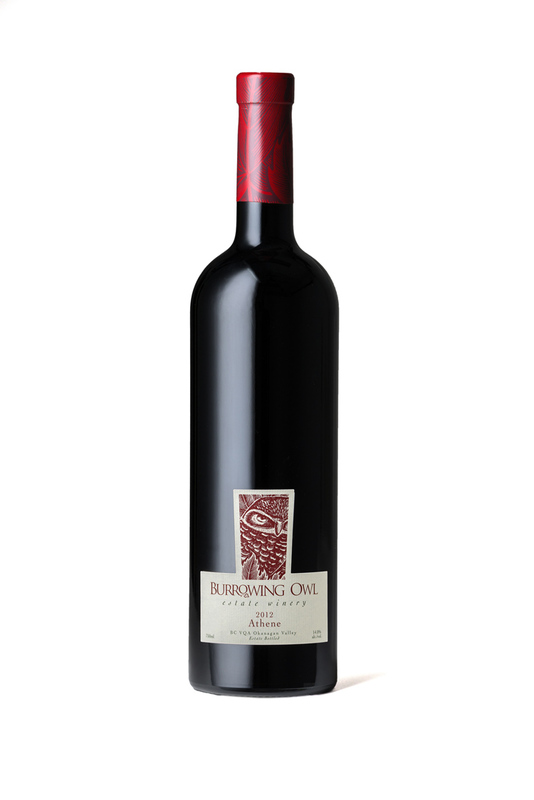 Burrowing Owl, of course, has won two LGs: in 2013 for a 2010 Cabernet Franc and in 2005 for a 2003 Syrah. Given the winery’s latest awards, perhaps its peers were happy not to have to compete with Burrowing Owl wines at the LG Awards this year. Gold for its 2012 Syrah at the Syrah du Monde 2015 in France. This was the only Canadian Syrah to take home a medal this year. Double gold for the 2012 Merlot at the San Francisco International Wine Competition, along with gold for the 2011 Meritage, four silvers and and three bronze medals. Gold for 2012 Athene at the International Wine & Spirits Competition 2015, along with five silvers and two bronze medals. The entry fee for IWSC is £130 per entry and four bottles are required. Silver for 2013 Chardonnay and 2012 Pinot Noir at the Decanter World Wine Awards 2015, plus four bronze medals and two commendations. A complete (and impressive) list of Burrowing Owl’s extensive awards is on the winery’s website. Just click on “Purchase” and then “Awards” at the bottom of that menu. One thing struck me as I looked over the list: judges are not always consistent from one competition to another. For example, the 2012 Syrah won silver at the IWSC competition, a bronze at San Francisco and a commendation, which seems just slightly less than bronze, at Decanter. Of course, the Syrah du Monde, now in its ninth year, is a tightly focussed competition. This year 418 wines were entered and a total of 38 golds were awarded. I have been able to taste six of Burrowing Owl’s recent releases, most of which have been in competitions. Never mind if the judges are all over the map. These are first rate wines. 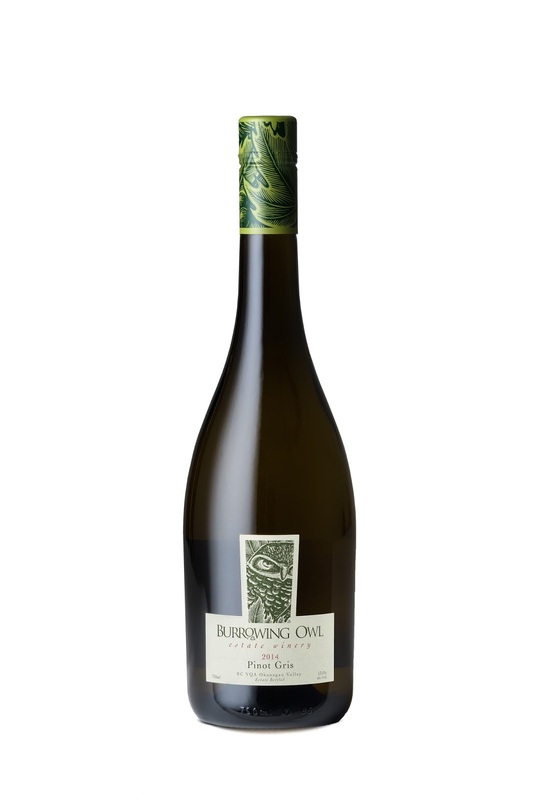 Burrowing Owl Pinot Gris 2014 ($20). The wine begins with appealing aromas of citrus and pear. On the palate, there are flavours of pear, peach, apple and pink grapefruit. The texture is juicy and the finish seems endless. 91. 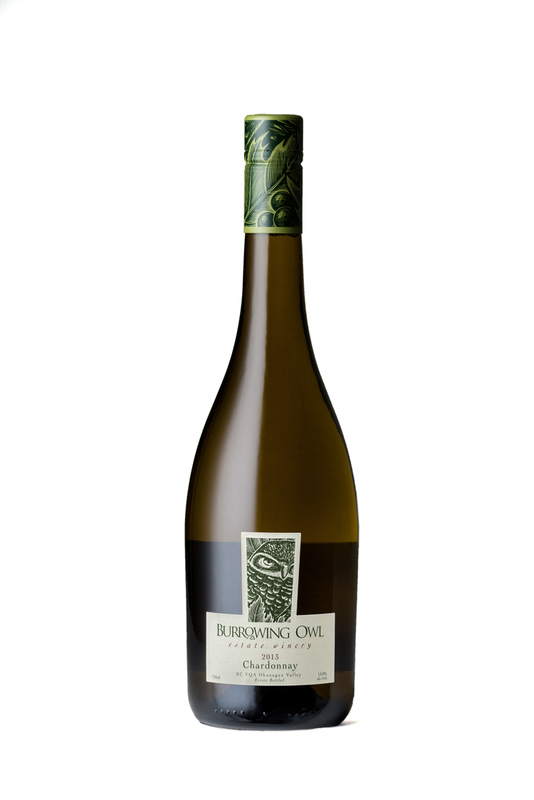 Burrowing Owl Chardonnay 2013 ($25). The winery fermented 60% of the wine in stainless steel and 40% in oak. This means the wine retains fresh and vibrant fruit while enhancing the texture and complexity. The wine also was aged 10 months in French oak (25% new). It begins with aromas of citrus and nectarine, leading to flavours of tangerine and melon with a hint of vanilla (from the barrels). The texture is rich and the finish is long. Good acidity promotes fresh flavours as well as giving the wine the potential to age for several years. 91. 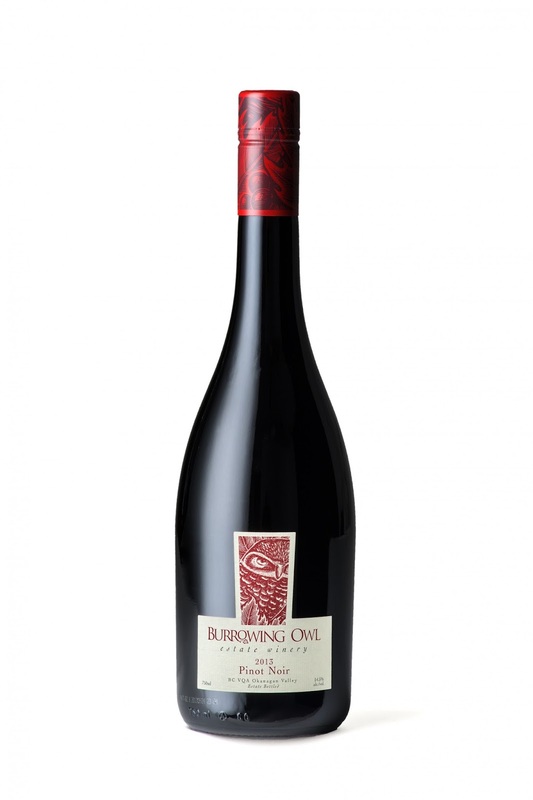 Burrowing Owl Pinot Noir 2013 ($30). The winery’s reds are always big and bold; this is no exception. Dark in colour, it has intense aromas of raspberry and cherry that lead to meaty, earthy flavours dominated by strawberries’ and cherries. The wine is robust on the palate and has a long, spicy finish. 90. Burrowing Owl Cabernet Franc 2012 ($33). This shows the variety’s classic brambly aromas and flavours: raspberry, blackberry, black cherries and blueberries. The structure is firm and age-worthy, although the 22 months of barrel aging have given the wine a polished texture. Decant now or cellar for five years. 92. 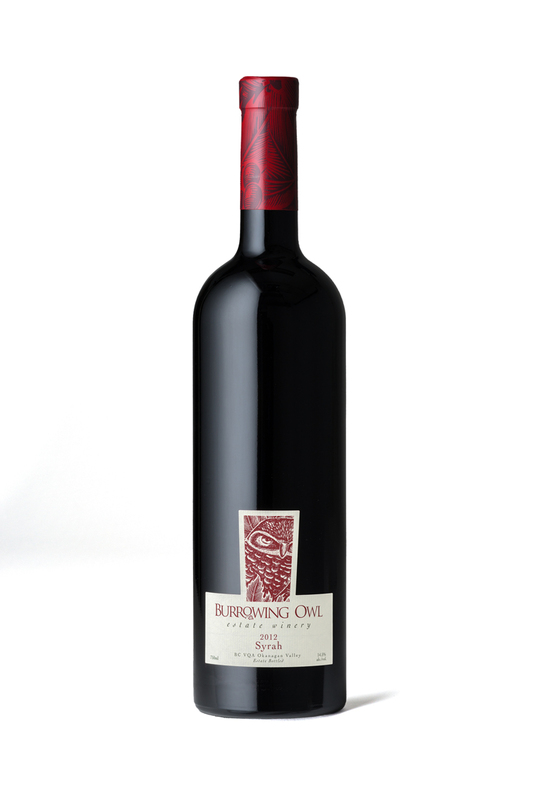 Burrowing Owl Syrah 2012 ($33). There is no question that this delicious wine deserves a gold medal. It begins with aromas of plum, blueberry and cassis. It is full on the palate with flavours of black cherry, plum, leather and tobacco. A touch of black pepper anchors the long, earthy finish. 93. Burrowing Owl Athene 2012 ($38). This is a blend of 53% Syrah and 47% Cabernet Sauvignon, co-fermented and aged 21 months in barrel (85% French and 25% new). It begins with aromas of black cherry and cocoa, leading to flavours of black cherry, black currant, espresso coffee and dark chocolate, with spike and black pepper on the finish. The generous texture makes this wine bold and satisfying. 92. The new wine shop which Tightrope Winery opened last month constitutes one more must-see winery on the Naramata Bench. The tasting room, generous in size and elegant in design, offers a superb view over vineyards and Okanagan Lake beyond the vineyards. The winery, operated by Lyndsay and Graham O’Rourke, began selling its wines in 2013 under the license of nearby Ruby Blues Winery. At the time, Lyndsay also was the winemaker at Ruby Blues. It is a position she has turned over to Blair Gillingham now that Tightrope has its own license and rising production. After growing up in Southern Ontario, Graham trekked across the country and spent a few years enjoying the outdoor life that Whistler, B.C. has to offer by skiing, mountain biking, playing rugby, and meeting his future wife carving the snowy slopes and sipping fine wines. Having grown up in British Columbia Lyndsay has been aware of the fine grape growing conditions the Okanagan Valley has to offer since the onset of her own wine passion. Once the couple had their first child they decided that the environment of the Okanagan would be ideal for cultivating a family as well as their dreamed-of winery. Initiating a formal education on the subject of how to best cultivate the vines that produce the wines they love, they discovered that the vineyard life and winemaking were passions that they shared and wished to further pursue in their life together. The growing family relocated to New Zealand for a more advanced and thorough education on this subject that has proven to be their life-focus. Having attained honours degrees in both oenology and viticulture while studying in New Zealand at Lincoln University, Lyndsay and Graham made a welcome return to the Okanagan Valley, settling on the Naramata Bench in 2007. Since that time both have been hard at work honing their skills and practicing their trade, enabling that they can excel in their chosen profession. Lyndsay has traded in her snowboarding boots for a pair of Wellies, and was been an outstanding, award-winning winemaker for the Ruby Blues Winery along the Naramata Bench from 2009 to 2014. In 2012 and 2014 Ruby Blues won the Lieutenant Governor’s Award for their 2011 and 2013 Viognier. Lyndsay has now turned her focus to Tightrope Winery full time and continues to craft award winning wines in the new Tightrope facility! After their return to Canada, Graham went to work for Mission Hill Winery as one of their lead viticulturists. Managing numerous acres of different varietals successfully through many seasons allowed Graham to put into practice those hours of study, and he has stowed the mountain bike in the garage in favour of overalls and a tractor. 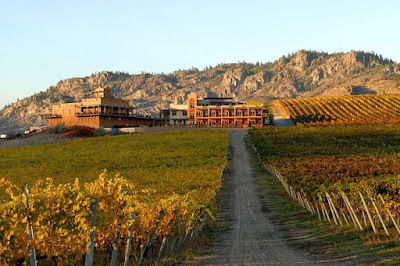 2012 saw Graham leave Mission Hill to focus on the O’Rourke’s own 10 acre property along the Naramata Bench at Fleet Road, from which all of the Tightrope grapes derive. Tightrope Riesling 2012 ($20). This is now sold out. It has developed into a classic dry Riesling with “petrol” on the nose and a bit on the palate. Perhaps a better descriptor is marmalade, especially on the palate. The acidity is balanced with a bit of residual sugar and the wine finish dry. 91. Tightrope Riesling 2013 ($20). The wine begins with floral and citrus aromas. The wine has more weight on the palate, with juicy flavours of grapefruit and with 13.3% alcohol, the result of a warmer year. 90. Tightrope Viognier 2013 ($27). The wine begins with aromas of citrus and cumin spice, leading to flavours of apricot, tangerine, ginger and vanilla. The wine was partially barrel-fermented. 90. Tightrope Viognier 2014 ($27). Perhaps because there is Similkameen fruit blended in this wine, it is bold and ripe, with flavours of peach and apricot. 90. Tightrope Tip-Toe 2014 ($21). This is a blend of Gewürztraminer (46%) with Riesling and Chardonnay. It begins with aromas of rose petal and lychee and has flavours of citrus, pear and mandarin. The fresh acidity gives this wine a refreshing finish. 91. Tightrope Pinot Gris 2014 ($20). This is an appealingly refreshing wine made in the fruit-forward Pinot Grigio style (alcohol of 12.8%). It has flavours of apples, peaches and pears, with a hint of sweetness on the finish. 90. Tightrope Rosé 2014 ($20). This is a blend of 95% Pinot Noir and 5% Barbera. The wine is dark in hue, with aromas and flavours of raspberry, cherry and strawberry. The texture is juicy and the delicious finish lingers. 91. Tightrope Vertigo 2013 ($28). This is an approachable red blend – 50% Merlot and 25% each of Cabernet Franc and Barbera. It has flavours of plum, black currant and chocolate with a touch of pepper and a hint of oak. 90. Tightrope Pinot Noir 2013 ($32). Dark ruby in colour, this wine begins with aromas of spice, cherry, strawberry and mocha. It is rich on the palate with flavours cherry, raspberry, plum and mocha, all subtly framed with oak. The texture is seductively silky and the finish is persistent. This is an outstanding wine. 93. Mary McDermott moved from Ontario in the summer of 2014 to take over making wine at Township 7 Vineyards & Winery in Penticton. The winery has now released three of the whites and a rosé that she made in that vintage. It did not take her long to put her imprint on the wines – and it is quite a positive impact. That is not to take anything away from her predecessor, Brad Cooper, who moved on to Serendipity Winery. Earlier this year, the winery released reds he had made. My reviews were delayed, but finally here they are. They are also pretty solid wines. She was recruited by Township 7 after new owners acquired the winery in 2014. Mike Raffan, a former owner and now general manager, says that the new owners also have invested in improvements in the winery’s facilities. Possibly, new equipment also accounts for the pristine polish that the 2014 wines show. Township 7 Sauvignon Blanc 2014 ($17.38 for 1,058 cases). Details matter. Ten per cent of this was fermented in neutral barrels, a technique to add some fullness to a wine that can be linear. The wine begins with aromas of lime and herbs. The flavours are intense, with notes of lime, lemon and peach wrapped around a spine of minerals. The wine has a crisp, dry finish. 89. Township 7 Unoaked Chardonnay 2014 ($16.51 for 398 cases). This wine begins with appealing aromas of apple and pineapple. These are echoed in the flavours. The palate is crisp, with flavours that have a laser beam focus and freshness. The finish is very long. 91. Township 7 Chardonnay 2014 ($18.25 for 498 cases). This wine is well differentiated from the extremely fruit-forward style of the unoaked version. Half was fermented in stainless steel while the other half was fermented in French and American oak barrels (18% new). The subtle oak shows in a delicate note of vanilla and in the full texture. But the aromas and flavours of citrus, apple and stone fruit remain brightly in the foreground. The racy acidity adds to a crisp finish. This Chardonnay has the structure to age for another four or five years. 91. Township 7 7 Blanc 2013 ($19.99 for 328 cases). This is 60% Gewürztraminer, 40% Pinot Gris, a blend that marries flavour with good acidity. The wine has a spicy aroma leading to flavours of pear, grapefruit and ginger. There is a touch of residual sugar here. 89. Township 7 Rosé 2014 ($17.38 for 198 cases). This is 95% Merlot, with five per cent of Muscat to lift the aroma and the fruit flavours. The wine, which has a pale salmon hue, has aromas of strawberries and cherries. The superb weight of this wine takes one by surprise. This is a dry rosé but the fruit flavours are full and intense. The finish is refreshing. 91. Township 7 Merlot 2012 ($25.99 for 1,398 cases). This wine is a generous mouthful of vibrant flavours of black cherry, black currant and vanilla, with attractive red berry aromas. The long ripe tannins give the wine good weight and length. 90. Township 7 Cabernet Sauvignon 2012 Blue Terrace Vineyard ($26.99 for 498 cases). Township 7 has been buying grapes for a decade from this vineyard at the north end of Black Sage Road. The wine begins with aromas of red fruit (cherry, raspberry, black currant) and vanilla. On the palate, there are flavours of black currant and plum. The texture is firm; the wine benefits from decanting, as one would expect. Blue Grouse Estate Winery & Vineyard has set a high standard for winery architecture on Vancouver Island with new winery and tasting room that opened last month. “We hope that Blue Grouse will become a destination,” says Paul Brunner, the mining engineer who bought the winery in 2012 from its founders, Hans Kiltz and his family. You can be assured a building this spectacular will be on every wine tourist’s must-visit list in the Cowichan Valley. I was struck by the private comment of one industry veteran who suggested the building does not “fit” the Cowichan Valley. I suppose Paul could have built something more in keeping the valley’s dairy barns. But hardly anyone tours dairy barns. The new Blue Grouse winery should provide a real shot in the arm to wine touring in the valley. To design the winery, Paul hired Joe Chauncey of Boxwood Architects in Seattle. He incorporated features of a grouse in the design. The roofline resembles the curve of a grouse’s head and neck. The curves of the tasting room soaring ceiling are meant to remind one of a grouse’s belly. The new building occupies the footprint of the former winery but is a good deal larger. The winery is taller, with a mezzanine overlooking the vineyard. In fact, everything has been scaled up, including a much larger parking lot in anticipation of growth in visitor numbers the building should inspire. The new owner also has allowed his winemaker, Bailey Williamson, to increase the portfolio with a second label – called Quill - using purchased fruit. This property was a pioneering, if tiny, Cowichan Valley vineyard, planted in 1977, according to the winery. A German-born veterinarian, Hans Kiltz, bought the property in 1989 and opened the winery in 1992. The small size of the vineyard – somewhere between seven and ten acres – limited his production. However, Hans was among the band of Vancouver Island winemakers who never bought Okanagan grapes. The wines now being released under the Blue Grouse label continue to be made just from estate-grown grapes. But Paul has had to expand production to justify what he has invested in buying Blue Grouse and redeveloping the winery. Paul was born in Colorado in 1950, the son of a Swiss-born carpenter and developer. His family moved to Canada in the 1960s and became Canadian citizens. Paul has a mining technology diploma from the British Columbia Institute of Technology, an engineering degree at the Colorado School of Mines and a master’s in business administration from Harvard. He parlayed that into a long career with an international drilling services company called Boart Longyear. He was the company’s chief executive in 2008 when he retired. His business career took him, and Cristina, his Peruvian-born wife, to numerous wine-producing countries, including Chile, South Africa, Australia and the United States. Eventually, their love of wine led to invest in their own winery. I took advantage of an invitation to Blue Grouse’s grand opening to visit three other Cowichan Valley wineries. One of them, Unsworth Vineyards, opened an elegant wine shop several years ago with a patio that looks over a large and attractive pond. Unsworth also operates a well-regarded restaurant, something that is still to come at Blue Grouse. The other two wineries are Enrico Vineyards and Glenterra Vineyards. Here are notes on wines I was able to taste. Blue Grouse Estate Bacchus 2013 ($20 for 80 cases). This wine has floral and spicy aromas, leading to flavours of grapefruit and grapefruit rind. The finish is crisp and bone dry. 88. Blue Grouse Estate Ortega 2013 ($20 for 321 cases). The wine begins with a lovely floral aroma, with hints of apple. On the palate, there are flavours of lime, lemon and tangerine. 90. Blue Grouse Estate Siegerrebe 2013 ($20 for 102 cases). This early-ripening grape does well in coastal vineyards. The wine invariably is thespian, with dramatic spicy aromas of lime and grapefruit. It delivers a bucket of tropical fruit flavours. This wine has a crisply dry and refreshing finish. 90. Blue Grouse Estate Pinot Gris 2013($19 for 133 cases). The winemaker fermented most of the grapes in stainless steel but also fermented 20% in barrel. The generous texture of the wine benefitted from that. The wine has aromas and flavours of pear and melon. 90. Blue Grouse Estate Pinot Noir 2012 ($24 for 130 cases). This wine was aged 10 months in barrel (30% new French oak). There is a hint of oak in the aroma with flavours of cherry. 89. Blue Grouse Estate Pinot Noir 2013 (barrel sample). This has appealing aromas and flavours of cherry and strawberry, with a spicy note on the finish. The wine shows more concentration and fullness than the previous vintage while retaining the minerality of the vineyard. 90. Blue Grouse Estate Black Muscat 2012 ($30 for 46 cases). Blue Grouse claims to grow the only Black Muscat vines in North America. The wine is always a surprise in the glass. It is dark in colour with dramatically spicy aromas and flavours of boysenberries. The finish is totally dry. It is an excellent wine with cheese. 89. Blue Grouse Quill White 2013 ($17 for 389 cases). This is a blend of 39% Pinot Gris, 36% Ortega, 15% Gewurztraminer and 10% Müller-Thurgau. Half of the grapes were sourced in the Okanagan, half came from the estate. This is a juicy white, with aromas and flavours of lime, apple and peach. 88. Blue Grouse Quill Rosé 2013 ($17 for 140 cases). This is made from Gamay Noir purchased from a Cowichan Valley vineyard. Light-bodied and refreshing, it has aromas and flavours of strawberry, cranberry and red currant. 90. Blue Grouse Quill Red 2012 ($19 for 205 cases). This is a blend of three island grown grapes and one from the Okanagan: 47% Cabernet Foch, 21% Maréchal Foch, 11% Cabernet Libre and 21% Merlot. The aromas are dominated by the singular spikiness of the Cabernet Foch and Cabernet Libre, two varieties developed by Swiss breeder Valentin Blattner. There are flavours of black cherry, black currant, vanilla and chocolate. 89. Enrico Vineyards, owned by Victoria businessman Harry Smith, opened in 2010. A former defenseman on the 1961 world champion Trail Smoke Eaters, Harry walked away from a Detroit Red Wings training camp in the 1960s because he though he could do better in business. How right he was! His ventures have range from shopping centres to a Hawaii coffee plantation and Columbia Fuels Inc., the largest petroleum products distributor on Vancouver Island. The Enrico vineyard is on a farm he bought in 2000. His winemaker is Daniel Cosman, also the winemaker for Unsworth. Enrico Celebration 2012 ($24). This is a Charmat method sparkling wine made with Pinot Gris and Pinot Noir. Almost gold in colour, it has flavours of nuts and orange peel with a rich texture from lees contact. 87. Enrico Ortega 2014 ($17.50). This wine begins with lovely floral aromas. On the palate, it is intensely fruity with flavours of peach and lime. The residual sweetness lifts the flavours and gives the wine a juicy texture. 90. Enrico Pinot Gris 2014 ($18.50). This is a refreshingly crisp wine, with aromas and flavours of spice, pears and peaches. 90. Enrico Pinot Gris Reserve 2014 ($24). This is a barrel-fermented wine from the best grapes selected from the winery’s 3 ½ acres of Pinot Gris. The wine has an appealing core of sweet fruit flavours (apple, pear and citrus) with a hint of oak in the aroma. 91. Enrico Red Dragon 2013 ($17.50). This is a curious name for a delicate rosé made from Pinot Noir. The wine has aromas and flavours of strawberry. 88. Enrico Merlot Cabernet Sauvignon 2011 ($20). This wine is made from Okanagan grapes. The wine is still a bit firm and should be decanted. There is a hint of mint and black currant on the nose, leading to flavours of black currant, plum and dark chocolate. 88. Enrico Cabernet Foch 2012 ($18.50). This estate-grown wine is claimed to be Vancouver Island’s first 100% varietal red from this Blattner hybrid. The wine is dark and full-bodied with aromas of mint, pepper and earth, leading to flavours of plum. There is an intimation of deli spices. 90. Enrico Cabernet Libre 2012 ($18.50). This is another estate-grown Blattner hybrid. The hallmark of this variety seems to be a distinctive peppery and earthy aroma. The wine is lean, with flavours of cherry. 88. Glenterra Vineyards is a 15-year-old winery operated by a remarkably modest winemaker called John Kelly. Perhaps his modesty accounts for Glenterra being lower on the radar screen than it should be. The wines here always are interesting, displaying the hand of one of the island’s best winemakers. Glenterra Vivace 2014 ($20). This is a blend from a large number of experimental white grapes that were already in the vineyard when John bought it. It is hard to pin down the elusively fruity, spicy flavours of this dry white. 89. Glenterra Brio 2012 ($25). This is a blend of the experimental reds in the vineyard, supplanted with Okanagan fruit (mostly Merlot). The wine is delicious, with a good body and with flavours of black currant, plum and vanilla. 90. Glenterra Orange Pinot Gris 2014 (N.A.). John Kelly has joined the growing number of leading edge winemakers who produce so-called orange or natural wines. In this case, the Pinot Gris is fermented on the skins with wild yeast and left on the skins for some time. The result is a bronze wine with flavours of herbs, grapefruit, and dried orange peel. The wine is quite dry, verging on austere. It begs to be aged. 90. Unsworth Vineyards was established in 2010 by Tim and Colleen Turyk. They come to wine from operating a large fish packing business. The winery occupies a 32-acre farm on which a previous owner had planted Maréchal Foch in 2006 but then abandoned plans for a winery. With its spacious tasting room and restaurant, this has become a popular stop for wine tourists. Unsworth Charme de L’ile NV ($21.00). This sparkling wine is described by the winery as a “Proseco style” wine. It is made with 50% Pinot Noir, 30% Pinot Gris and 20% Sauvignette, all from the Cowichan Valley. The wine begins with clean fruity aromas, leading to flavours of apple and citrus. 88. Unsworth Pinot Gris 2013 ($20). This is a delicious, refreshing wine with flavours of apples, pears and peaches and with a crisp finish. 89. Unsworth Allegro 2014 ($20). This crisp and tangy white reminded me a bit of Sauvignon Blanc (the blend is 50% Pinot Noir, 50% Sauvignette). It has a lightly pink hue, aromas of apples and flavours of lemon and lime. The wine’s fresh acidity gives it a vibrant finish. 90. Unsworth Petit Milo 2014 ($23). This variety, along with Sauvignette, is a white hybrid developed by Valentine Blattner (with significant work by Paul Troop and Daniel Cosman, partners in an island grape nursery). This wine has aromas of grapefruit and lime, with flavours of peaches and guava. The noticeable residual sweetness lifts the flavours and gives the wine a juicy texture. 88. Unsworth Rosé 2014 ($19). This won double gold at the All Canadian Wine Championships. Made with Pinot Noir, it has aromas and flavours of strawberries and raspberries. The finish is dry and refreshing. 90. Unsworth Cab Merlot Timbucktwo 2012 ($20). The blend is 95% Merlot from Naramata Bench, 5% Cabernet Libre from the estate. The latter brings a note of spice to the aroma. There are flavours of black currant and plum. The soft tannins make this wine approachable and easy-drinking. 87. Unsworth Symphony 2012 ($22). This is by far the best Blattner red I have yet tasted. The wine is 85% Cabernet Libre and 15% Petit Milo, aged 26 months in American and French oak barrels. It begins with aromas that the winery describes as “cooked cherries” and goes on to deliver flavours of fig, liquorice, chocolate, earth and spice. 91. Unsworth Ovation NV ($21.50 for 500 ml). This is a port-style wine made with Maréchal Foch grapes. It is rich, with flavours of plums, figs and liquorice. 91. Having a Merlot lover in the house always creates issues when Pinot Noirs need to be assessed over dinner. However, a strange thing happened when we were assessing the 2012 Blue Mountain Reserve Pinot Noir. “Pretty good,” the Merlot lover said. How good? When I reached for the bottle to finish the last glass, the bottle was empty. As they would say in tennis, advantage Pinot Noir. Blue Mountain has been making consistently good Pinot Noir since 1991. Winemaker Matt Mavety, one of the family that owns this winery, has made significant technical changes in recent vintages that seem to have yielded further improvements. I also note that the winery suggests the 2013 will age six to seven years while the 2012 will age seven to eight years. My experience confirms that these are ageable wines. Recently, I opened a 2008 Blue Mountain Pinot Noir (the regular, not the estate). The wine was dark, showing no significant browning. The structure was firm (but not hard) and the fruit was still full of life. Clearly, the wine is at a peak. I would not expect it to begin sliding into old age for another couple of years. That is not bad for a $25 bottle of wine. Blue Mountain wines are built to improve with moderate aging. Last fall, I had a long conversation with Matt about which wines in his portfolio are collectible. Naturally, he said all of them. “Nobody collects Gamay Noir,” I suggested. “Then they would be missing something,” he replied. Perhaps I will set aside a few bottles of the Gamay. Meanwhile, here are notes on the other wines that Blue Mountain released this spring. Blue Mountain Chardonnay 2013 ($20.90). This wine was fermented and aged 45% in stainless steel, 55% in French oak barrels (new to three years old). On the nose, there are aromas of citrus with a hint of toast, leading to refreshing flavours of apple touched with notes of lemon and hints of good lees aging. The texture is generous with a terroir driven backbone of minerals. This elegant wine is designed to age into an Okanagan answer to Burgundy. 90. Blue Mountain Reserve Chardonnay 2012 ($29.90). Here is another ageable Chardonnay. The winemaker deliberately did not allow it to go through malolactic fermentation, thus retaining the good acidity that keeps the fruit flavours fresh. The wine begins with aromas of citrus mingled with lightly toasted oak and notes of lees. Half of this wine was fermented and aged in French oak. The texture is full, almost fleshy, with flavours of lemon, tangerine and peach that linger on a lightly spicy finish. 92. Blue Mountain Reserve Pinot Gris 2012 ($27.90). In a blind tasting, one might take this for a Pinot Gris from a fine producer in Alsace. The wine – 40% of which was fermented and aged in French oak – begins with aromas of toasted oak and lees mingled with pear. On the palate, there is a layered cascade of fruit flavours – apple, pear, citrus – and a finish that just won’t quit. With its structure and its good acidity, this wine age as readily as the Pinot Noirs. 92. Blue Mountain Pinot Noir 2013 ($24.90). This is a blend of six clones from vines ranging from seven to 29 years in age. The wine was aged 10 months in French oak before being bottled. It begins with aromas of lightly toasted oak mingled with cherry. The palate is silky, with flavours of cherry and raspberry, with a touch of vanilla and mocha. 91. Blue Mountain Reserve Pinot Noir 2012 ($39.90). This wine, which spent 10 months in French oak, has benefitted from significant bottle aging before release. Dark ruby in colour, the wine begins with aromas of lightly toasted oak mingled with red fruit. On the palate, there are rich flavours of strawberry and plum supported by toasty oak. The texture is silky and the finish is spicy. The wine is seductive and delicious. 93. Sea Star Vineyards &; Winery on Pender Island debuted last year with startlingly good wines. It turns out that Sea Star is not a one-shot wonder. The recently released wines from the 2014 are every bit as good, it not better. Credit goes to owner David Goudge and his winemaker, Ian Baker. David, who has lived on Pender Island for about seven years, purchased the predecessor winery, Morning Bay in 2011. The original winery, an attractive building set amidst the forest, was still there. So was the seven-acre vineyard that had been planted in 2002. David resuscitated there property by invested in new equipment, a climate controlled barrel cellar and an updated wine shop. To manage the vineyard and make the wines, he hired Ian Baker, who had formerly done the same duties at Mistaken Identity Vineyards on Salt Spring Island. It is apparent they are a good team. He came to Vancouver to study architecture at the University of British Columbia. Then he went briefly into the restaurant business before establishing himself as a Vancouver real estate agent. Ian (left) is a one time Department of Fisheries employee and the former operator of a landscape business in Qualicum Beach on Vancouver Island. More to the point, he was a long-time amateur winemaker with, as one of his former partners said, “a box of medals.” He came to Sea Star in 2013 after about four years with Mistaken Identity. The Pender Island grapes in the winery’s whites are from the 5,000 vines at Sea Star’s vineyard and the 7,000 vines at the 5.5-acre vineyard at Clam Bay Farm on North Pender Island. Encore, the 2013 Bordeaux blend, is made with red varieties purchased from Okanagan growers because those varieties would never ripen on Pender Island. Sea Star Salish Sea 2014 ($15.75 for 515 cases). This is a blend of Ortega and Siegerrebe. It begins with a glorious aroma of tropical fruits and flowers, continuing on to flavours of lime and grapefruit mingled with herb and spice. Once again, the wine is very well balance to give the perception of a dry finish, with lingering fruit. Another refreshing white. 91. Sea Star Encore 2013 ($21.75 for 470 cases). This is a blend of Merlot, Cabernet Franc and Cabernet Sauvignon. It has been aged months in new and used French oak. The wine is still bright and youthful; I decanted the wine as recommended by the winery. It begins with aromas of red currants and noticeable oak. On the palate, there are flavours of black currant, prune, chocolate and liquorice. Because the oak has not finished marrying with the fruit, this wine will benefit from another year of bottle aging before being opened. And the winemaker knows that. The wine has been released now because of consumer demand. 88-90. The appreciation of rosé wines has risen dramatically during the past decade – to the point that Riedel Crystal of Austria has just announced a wine glass specifically for rosé. “Rosé has become one of the most frequently enjoyed and trendy wine styles worldwide, especially in the US,” said Maximilian Riedel, president and CEO of Riedel Crystal. The company designed the wine glass in consultation with rosé producers in Provence. However, the shape would be suitable for virtually any rosé. Most of us have been drinking rosé wines with standard stemware for white wines. You will continue to enjoy the wines even if you never buy Riedel’s rosé glass. It is a fact (at least in my opinion) that Riedel stemware always makes the wines taste better. I have attended four or five tasting demonstrations, including at least two led by Maximilian’s father, Georg. There is no doubt that wines are diminished in poor stemware but are vastly better in the proper glass. The easiest way to grasp this is taste a Pinot Noir from, say, a hotel banquet glass and then taste it from a Riedel Pinot Noir glass. Pinot Noir, along with most other wines, dies in banquet glasses but remains alive and full of flavour in the Riedel glass. I have no doubt that a good rosé will be better in a Riedel glass. Here are notes on a selection of recent British Columbia rosés that I have enjoyed, even without the Riedel glass. Bench 1775 Glow 2014 ($19.90). This is a Malbec rosé, Salmon pink in hue, it has aromas and flavours of strawberry and rhubarb. It is a light, refreshing and dry rosé recalling rosé wines of the south of France. 89. Black Widow Syrah Rosé 2014 ($23 for 80 cases). This dry rosé is loaded with flavour. It begins with aromas of strawberry and raspberry and goes on to flavours of cherry and plum, with a lingering finish. 90. Covert Farm Family Estate Rosé 2013 ($18.29). This wine begins with an appealing cherry hue. It has aromas of cherries with an undertone of pomegranate and sweet tobacco. It may sound like an odd descriptor for a rosé but it sets up a savoury complexity which carries through to the palate with cherry and strawberry flavours. This is 75% Merlot, 21% Pinot Noir and 4% Syrah, co-fermented and aged on the lees. Note the wine also has a year of bottle age. With a dry finish, this is a rosé to pair with grilled salmon. 90. Mission Hill Five Vineyards Rosé 2014 ($14.99 ). The wine just gleams in the glass like a pale ruby. Fruity aromas, notably cherries, burst from the glass. On the palate, there are juicy flavours of strawberries, watermelon and pomegranate. The finish lingers. The hint of residual sweetness adds to the generous texture of this delicious summer wine. It is 85% Merlot, 10% Pinot Noir and 5% Syrah. 90. Roche Rosé 2014 ($19.98 for 185 cases). Roche is the label of artisan producers Dylan and Pénélope Roche who have a small vineyard on the Naramata Bench. This wine is 93% Zweigelt and 7% Schönburger (co-fermented). The wine begins with a brilliant jewel-like hue. It has aromas of strawberries and pink grapefruit, leading to flavours of strawberry, pomegranate and cherry. The wine is refreshing, with good body and with a lingering dry finish. 91. Sage Bush Rosé 2012 ($NA). The wine begins with a pale, slightly bronze tint. On the nose, there are aromas of strawberry jam that are echoed on the palate. There is an appealing spoonful of sweet fruit on the palate. Bottle age has added a roundness to this wine without taking away from its freshness. 89.